We’d love your help. Let us know what’s wrong with this preview of Dreams Thrown Away by Dilsa Saunders Bailey. What would you do if the man you love wants to love you to death? Beautiful, naïve and young Kali has already overcome one of the worst tragedies in anyone’s life, her parents’ deaths. When she meets the man of her dreams, she is hopeful that her haunted past has been put to rest and only happiness lies before her. Little does she know, his obsessive ideas of the ideal family may mirror deadly secrets hidden by his own powerful, tumultuous family. To ask other readers questions about Dreams Thrown Away, please sign up. Dreams. Dreams are a series of thoughts, images or emotions that occur while sleeping. Having daydreams is something that is pleasurable for you while you are awake. Most of us dream about what our lives would be like when we get older or what we want to be/want to do in life. Whenever you hear someone say "I'm living the dream", the things they thought about when they were younger is happening for them now. Is it possible to live the dream or is the best we can do is hope for the best? Kali Dreams. Dreams are a series of thoughts, images or emotions that occur while sleeping. Having daydreams is something that is pleasurable for you while you are awake. Most of us dream about what our lives would be like when we get older or what we want to be/want to do in life. Whenever you hear someone say "I'm living the dream", the things they thought about when they were younger is happening for them now. Is it possible to live the dream or is the best we can do is hope for the best? Kalina Denise Harris is a young girl with a lot of big dreams. Kalina comes from a small town but she has big city dreams, and she can't wait to leave this small town behind! Kalina has dreams of going to a big college and leaving all of the sadness that she has to endure living in that smal town. One day Kalina world is rocked to the core and now she doesn't want to leave this small town that she calls home but she has no other choice. What is she to do? Where will she go? How will she make it not being at home around people that she knows? By most accounts, I am considered a nerd. I write that because it is rare that I read books of fiction. However, I became curious about this book when a close friend of mine bought it (while visiting me from another state) and literally could not put it down! I wondered "what kind of book has a storyline so good that my friend nearly read it in one sitting?" Well, I soon found out when I bought the book myself. As I read the story of heroine, Kalina "Kali" Harris, I became completely engrossed! I By most accounts, I am considered a nerd. I write that because it is rare that I read books of fiction. However, I became curious about this book when a close friend of mine bought it (while visiting me from another state) and literally could not put it down! I wondered "what kind of book has a storyline so good that my friend nearly read it in one sitting?" Well, I soon found out when I bought the book myself. As I read the story of heroine, Kalina "Kali" Harris, I became completely engrossed! Imagine a story that is a hybrid of the Jason Bourne and The Girl with the Dragon Tattoo books/movies - it moves quickly and is filled with unexpected twists and turns with Kali emerging victorious every time...or so it seems until the next obstacle appears. It's a coming-of-age story that plays out unexpectedly and will leave you wanting to tell all of your friends about it. The book is well-written and left me anxiously anticipating cracking open the next book in The Sperling Chronicles - Split Images. 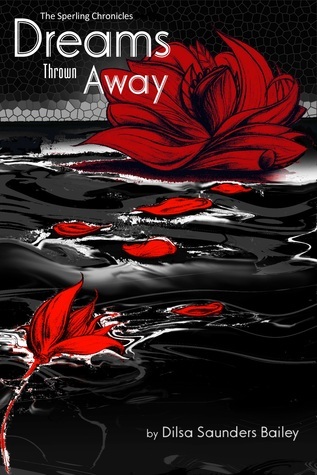 Dreams Thrown Away is fast-paced and believable with characters that will haunt you. Not only will you not want to put it down, you'll rush to continue with The Sperling Chronicles series. Dilsa Bailey is one to watch. Kalina Denise Harris has dreams of meeting a wealthy man who will sweep her off her feet. This seems to be the fantasy-fairytale dream for most single young women. In the opening chapter, “word is our bond” was a valuable lesson taught between father and daughter’s morning talk. Sometimes, we are willing to throw our own dreams and happiness away to please someone else to make them happy. The once happy, perfect home clashes before Kalina’s eyes, and discovers her only friend, Mandy, married and pregnant. She was hoping her only friend would also go to college too. Later, she has nowhere but to her aunt’s house in Philadelphia. This situation didn’t last very long. No longer a country girl with a drawl, has to learn the streets and runs into people who knew her mother and aunt—small world. Her naïve upbringing surely changes after two years of being under the household of Jordan living with his six grandsons by his son, Billy. This debut novel is a splendid read, beautifully written and delicately told with such horrid incidents flash on the pages once an adulterous affair goes berserk leaving the seventeen-year-old Kalina in a hopeless state. Dreams shattered in a tickling of an eye. Moreover, this story had twists and turns and tragic events I was not looking to bump into. The author also wrote a story that wasn’t predictable and hoped for a meaningful ending. I hope this author writes more entertaining and edgy stories because she has a fan! Lesson: Be careful what you do to others, for you will reap what you sow. Dream 4 More Reviews received a copy of "Dream Thrown Away" via pdf file (eBook) from the author for a book review. I was impressed with this book. The story is about a teenaged girl whose life is devastated by the murder -suicide of her parents by her father. Kalina is forced to grow up quickly after she leaves South Carolina to move to Philadelphia, PA. She has been sent to live with her Aunt Mazetta. Little did Kalina know that this would be the beginning of her being under the control of other people who don’t always have her best interest at heart. After her aunts boyfriend tried to sexually assault her, I was impressed with this book. The story is about a teenaged girl whose life is devastated by the murder -suicide of her parents by her father. Kalina is forced to grow up quickly after she leaves South Carolina to move to Philadelphia, PA. She has been sent to live with her Aunt Mazetta. Little did Kalina know that this would be the beginning of her being under the control of other people who don’t always have her best interest at heart. After her aunts boyfriend tried to sexually assault her, Kalina got away and ran away and never looked back. Thus begins her life of pursuing her dreams which came with a steep price. Kalina’s life is no longer her own and she seems to become complacent with this. That is until a life altering event forces her to choose between life and death. The reader will be caught up in Kalina’s story til the end. There are some unexpected twists and turns but the storyline is never lost. I didn’t want to put this book down once I started it. I believe strongly that anyone reading it will feel the same. "Dreams Thrown Away" by Dilsa Saunders Bailey was an excellent story. Following Kalina through her life's journey will have the reader not wanting to put the book down. Action packed, roller coaster plot involving Kalina Denise Harris from Roebuck, SC a 17 year old reeling from the murder suicide of her parents is sent to live with Aunt Mazetta in deplorable condition in Philadelphia but after being attack by her own aunt lands in the luxurious,mysterious and dangerous world of the Sperling men. Good character development, engaging plot with lots of spice. Good read. This was a great story about a girl who seems to be haunted by tragedy and followed by bad luck but she never give up on hope and dreams. It was a great page turned that I just could not put down. The author is working on a sequel and I cannot wait to read the next installment!